I've been posting bits and pieces of this scope on the "what did you work on today" thread for a few weeks now, and J.T. 's relocation of his build to its own thread has inspired me to do the same. This scope isn't meant for me, but for my girlfriend, Amanda. Amanda currently has two scopes. The first is an Orion StarMax 102 on a Vixen Mini Porta. Originally she had a Vixen VMC95L on said Mini Porta but the scope was basically impossible to collimate and had mediocre to poor images, so I swapped it for the StarMax OTA. Her other scope (temporarily) is my 1973 orange tube Celestron C8. It's a great scope but it's a little heavy and unwieldy for her, and I worry about fitting the tripod (a Wedgepod with non-adjustable legs) in her Toyota Camry without it damaging the seats or something. This project has gone through a lot of phases. Originally, it was meant to be a solid-tubed Dob with a mirror ground by Amanda herself. However, due to a lack of time needed to grind the mirror combined with a killer deal on an 8" f/5 Orion primary meant that I opted to instead build her the scope as a (sadly now belated) Christmas present. As it turns out, the spider purchased for the scope doesn't fit the tube we bought and painted, and I wanted a challenge, so I opted to build a truss scope instead. This meant ditching the original focuser purchased for the project, which means the sole original parts are now the spider and 2.14" Antares secondary mirror. 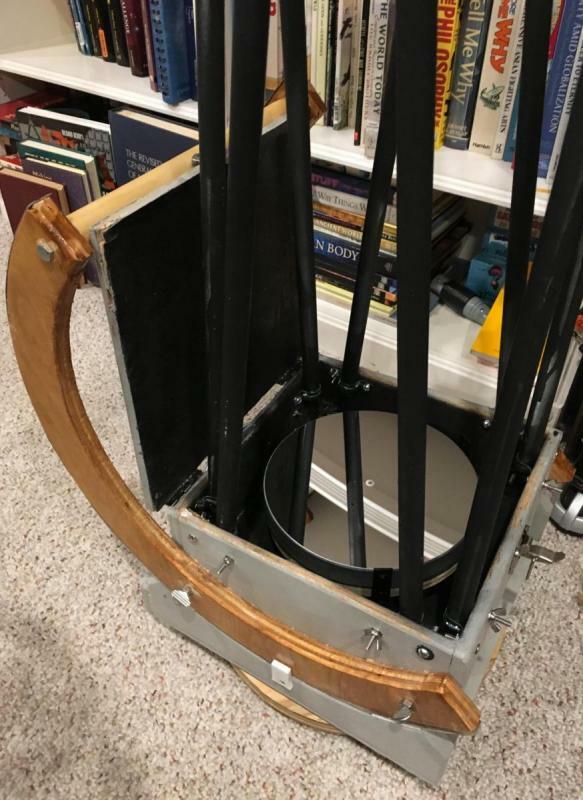 In addition to being completely different from my other truss Dobs, it's also a proof-of-concept for a 10" or 12" travel scope which I'll be bringing to Hawaii this summer. No plywood ring "mirror box"
I have also now opted to build a single-ring UTA, which is the only component I have yet to build. So at this point, it's basically an 8-pole truss Dob with a single ring UTA, enormous bearings, and a very short mirror box. The scope's bearings (as well as the brace between them) are detachable, the dust cover is hinged, and the truss pole clamps (electrical conduit clamps - I gave up on split blocks because they split and cracked so many times and gave me hand injuries) fit inside the mirror box, so one can put the bearings, rocker, trusses, and UTA in luggage and carry the mirror box on, allowing for transport on an airplane. The poles are "1/2-inch" (really about 5/8") electrical conduits - eight of them. Overkill, but it makes for an incredibly strong, inflexible OTA. The wood is 1/2" plywood for the mirror box and mirror cell, with the rest being 3/4" plywood. Fully assembled, the entire scope weighs a whopping 25 lbs. Yes...in theory it could be a bit lighter or more compact or use fancier/more expensive/totally optimized components...but sometimes over engineering things IS just a waste of time....unless over engineering IS the goal. Yeah, maybe a scope could weigh 15 pounds and easily fit under an airline seat....but does that really buy you anything over a 22 pound scope that reasonably fits under an airline seat ? And for that matter IMO these often uber optimized scopes...well...you are STILL paying a penalty of some kind to get there (the no free lunch theorem). 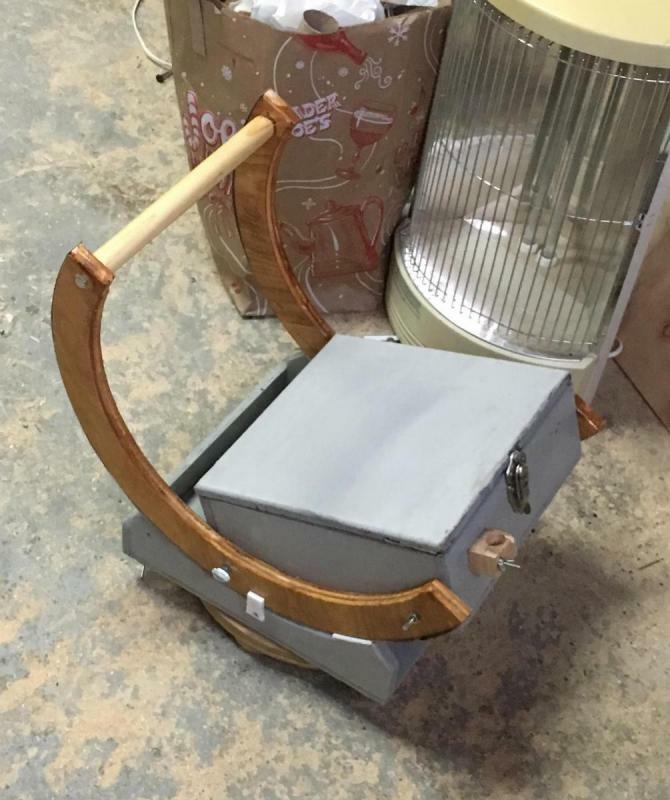 Whats up with exterior wood block/clamp thing in the first pic that is not seen in the second pic? Attempt at a split block. I ditched them and used electrical pole clamps instead. This scope isn't meant for me, but for my girlfriend, Amanda. Amanda currently has two scopes. This must be a serious relationship if you're already getting to third scope! I can't quite tell, but it appears to me that you may have a bit too much of arc of each vane in the light path. If so, you may want to rework the bends slightly and rotate your secondary holder a little so that the total amount of arc of all vanes adds up to only 180 degrees. To totally even out all diffraction energy the total sum of angles in a curved vane spider should be a multiple of 180 degrees, but ONLY 180 degrees is generally the best choice for maximum contrast. Only the portion outside of the secondary and inside the primary mirror's radius should be considered on this. I must say I love having a curved vane spider in my 10" dob. I reworked that one to 60 degrees/vane from a Destiny spider I got directly from Hans. Edited by jtsenghas, 03 January 2019 - 02:57 PM. I'm guessing the scope is going to end up needing springs for altitude tensioning.... any recommendations as to how to do that quickly and cheaply? Well, technically, it's the second. The C8 comes home once this scope is ready to replace it. Alright, will do my best to fix it. The curved spider was actually something she bought; I had recommended it but offered to just build a straight-vaned spider out of brass stock and doweling. I must say it really is well-made! The curved spider was actually something she bought; ! ... and you used it. Well played. Today's efforts yielded me with a nice, complete upper ring assembly. It's quite stiff - stiffer than I'd expected - and should have no problems with her 9mm Type 1 Nagler or 25mm ES70, the heaviest of her eyepieces. It should handle my Lunt XWAs fine for testing, too - but I suspect a Paracorr would be too much weight for it. Unfortunately, the scope is a couple pounds top-heavy. I tried moving the bearings up, and when I hammered in the threaded inserts, one of the mirror box sides split along the woodscrews. So, I need to build a new mirror box. Think I'll do dovetails this time and have her participate in the construction of it, so I'm going to practice doing dovetails this week and finish the UTA, and build the new box next weekend. Has Amanda continued work on her own mirror? Be a shame not to have a go at getting it finished. The truss poles are absurdly heavy and hard to cut/crush because they're steel. I was sold the wrong stuff. Between the poles themselves and the hardware and paint for them and the parts I bought to attempt to balance the scope, I've wasted a hundred bucks. Does anyone know of a cheap source of aluminum tubing? Or should I use 1/2" dowels? Edited by Augustus, 06 January 2019 - 10:39 PM. What is wrong with sticking with the steel tubing? If the scope won't quite balance...put some lead weights as far towards the back end as is possible....its not like you are going to go hiking with the telescope. Or rebuild the scope using the steel tubes and slightly deeper mirror box and slightly taller rocker box. But you'll have to do redesign and some math/"lab experiments" to determine if this is something that would still be workable for you. This thread that gets occasional updates has a few members recommending DX Engineering . Their prices are a bit lower than my usual source OnlineMetals.com. DX Engineering is a ham radio outfit and those tubes are generally sold for making antennas. You won't want the slitted tubes, which are designed for nesting diameters. I don't know what their shipping costs are but the piece prices are about as low as I've seen. Although they don't have many wall thickness choices, what they do have looks generally good for truss tube dimensions. Edited by jtsenghas, 06 January 2019 - 11:43 PM. So I bought the DX Engineering tubes, should be here in the next week or so. I decided that I'm going to opt with a 3-pole design and a circular mirror "box" like J.T's scope and Merope. Will post some pictures soon. Note that, as you go through Starman345's photos that there is one significant weakness in his design as shown, but I believe he has since remedied. 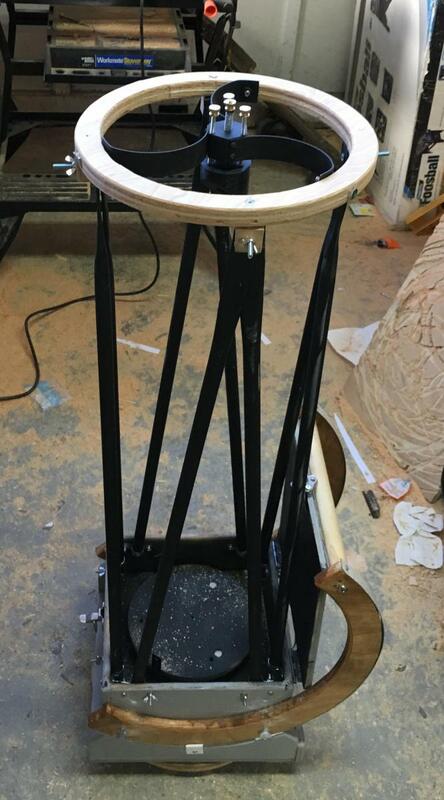 He put the hold down knob too close to the inboard end of the block on the lower truss attach points and, as a result it could flex upwards. I believe his remedy was to add another bolt and knob at the outboard end of that same block. This is more robust than ever, but does require him to attach at two points at the bottom of each truss pair. Edited by jtsenghas, 07 January 2019 - 01:37 PM. I'm going to try to re-use the existing rocker, but if not I can at least re-use the ground board. How wide (interior and exterior) does the mirror box need to be? I'm attaching the poles to the sides. Math. Looking down the optical axis, the truss poles form a regular hexagon. The middle of each side needs to be as far from the center as the diameter of your mirror. Knowing the diameter of your truss poles, you can figure out how far the CORNERS of the hexagon are from the center. If you are mounting the truss tubes to the side of the box, then that will be the radius of the mirror box. I'm not doing a hexapod, just three poles. Did the calculations and it should be plenty strong enough. 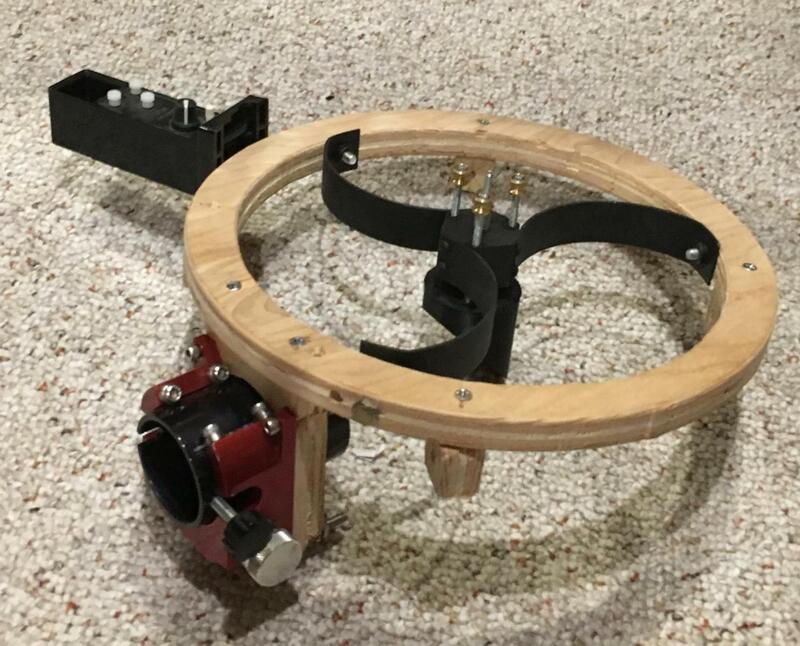 The hexapod just adds complexity for someone new to the hobby and especially Newtonians and collimating - also, it's harder for me to build. A three pole parallel structure is a strut telescope and requires the tubes to be very stiff in bending. (Trusses, alternatively are ideally in pure tension and compression.) The moment of inertia and resistance to bending of thin tubes varies with the fourth power of the diameter. This means, for example, that 1.25" poles are 2.44 times as resistant to bending as 1" poles. This calculator may help with comparisons. What dimension tubing have you ordered? Edited by jtsenghas, 10 January 2019 - 07:30 AM. 1/2", I forget the thickness but it's pretty thick. I bought six poles, so if it's too weak it's not particularly hard to put the other three on. Imagine a 3 truss / 6 pole system or a 4 truss 8 pole system. The reason (common knowledge here) they work so well is all you have to do is "pin" each end (like say with a bolt). The fact that the pole could easily rotate about the bolt is a non issue because with the geometry of the other pole involved it basically CAN'T with either being compressed, stretched (or slightly bent). Given the very light forces involved with telescopes this makes such a structure inherently very rigid for our needs. However, with a single pole out there...that does not happen. And it doesn't matter if the pole itself is infinitely rigid. The flex in that system is to a large degree going to be determined by how rigidly you clamp each end to prevent the rotation...the pole itself is not the limiting factor (unless you get something on the thin side...then its two bad things together). And its not just how hard you clamp it....it how the clamp clamps it and the geometry of the system. To restate it...the clamps themselves do most of the rotation/deflection prevention. Just my opinion Augustus...but if you are going with a 3 pole system you are probably going to have to have a clamping system that is better than what would work with a 3 or 4 truss system. Keep that in mind and perhaps have a plan B....constructing plan A with plan B in mind.